Its that time of year already! Christmas Bird Counts have been going on since 1900. But each year more volunteers are needed to perform the counts. You don't have to be an expert birder to join in on the fun, you will be paired with more experienced birders. There are several areas covered across the state, and the counts are performed one calendar day between December 14 and January 5 . 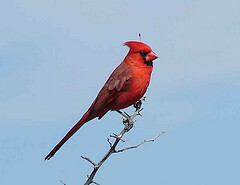 Check out the Arizona Christmas Bird Count Schedule 2011-2012 and contact one of the compilers to volunteer. The counts start early and last all day and are usually concluded with a compilation dinner where results are tallied and experiences are shared. A $5 donation to the Audubon is required by each participant. Christmas Counts near the Phoenix area include Tres Rios, Gila River, Salt and Verde River, Carefree, Hassayampa River and Superior. Make Christmas Bird Counts a part of your holiday tradition!